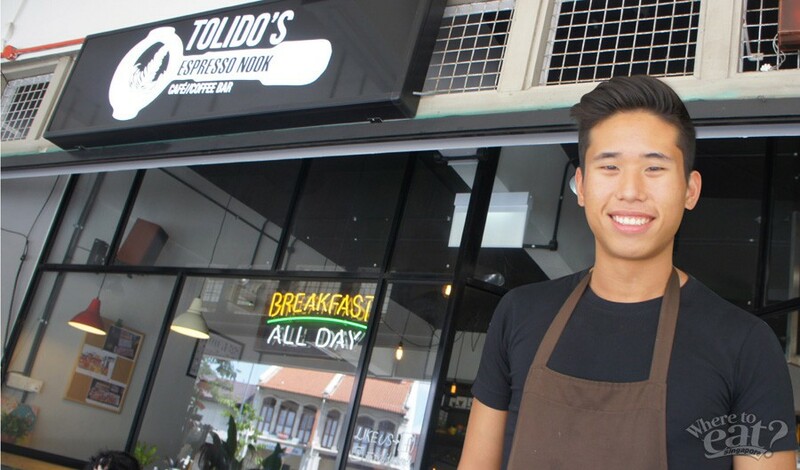 Tolido’s Espresso Nook sure stood out from the otherwise prosaic row of provision shops. 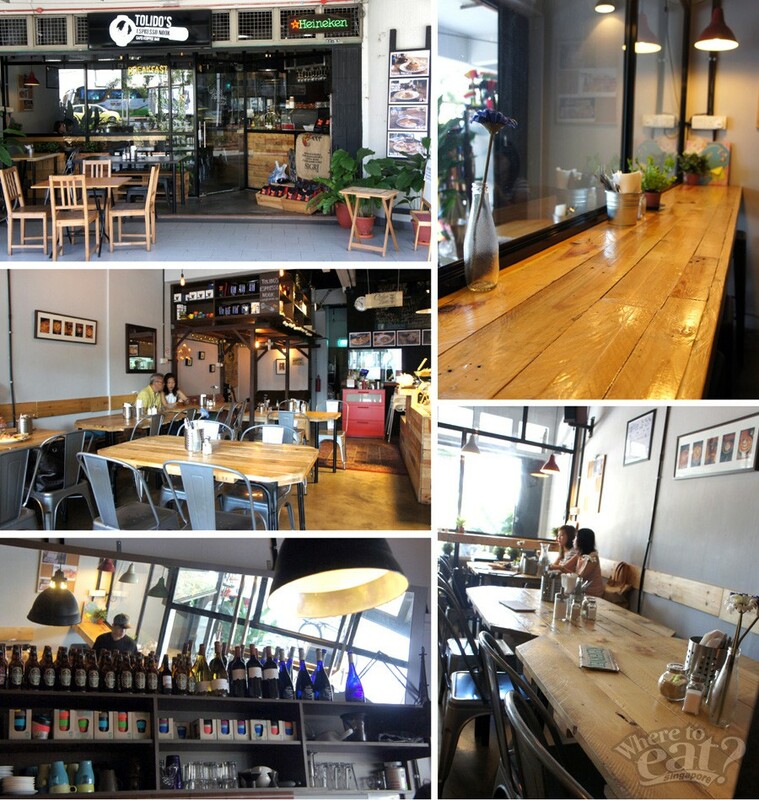 Its black and white hue with brown wood furniture (mostly handcrafted using recycled wood material) gave the locale a Melbourne-style casual and cool vibe that is refreshing. Head barista, Douglas, also shared with us how love, passion and attention are put into every cup of coffee brewed and food cooked, stressing that your orders are prepared upon order and do not come instantly. After all, good things come to those who wait. Douglas also recently won third place in the Singapore Latte Art Competition orgranised by Bettr Barista. 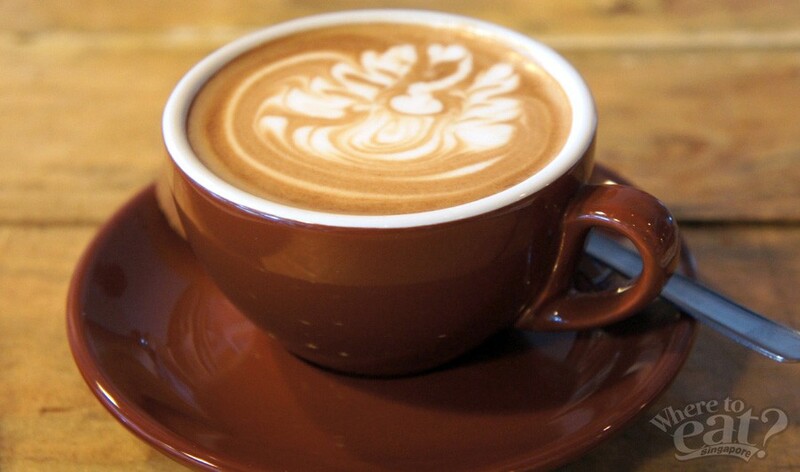 That pretty much explains the beautiful latte art on our Latte ($4.90). The coffee had a light weight and body with silky smooth froth, ideal to drink as your morning wake-you-up. We know we probably said this many times – everything goes with bacon. But everything means nothing when you have tried bacon with fried cereal. Cereal Bacon Rolls ($8.90) is the ultimate combo of light airy choux pastry, wrapped in juicy savoury over-baked pork bacon, and coated with spiced crispy fried cereal. 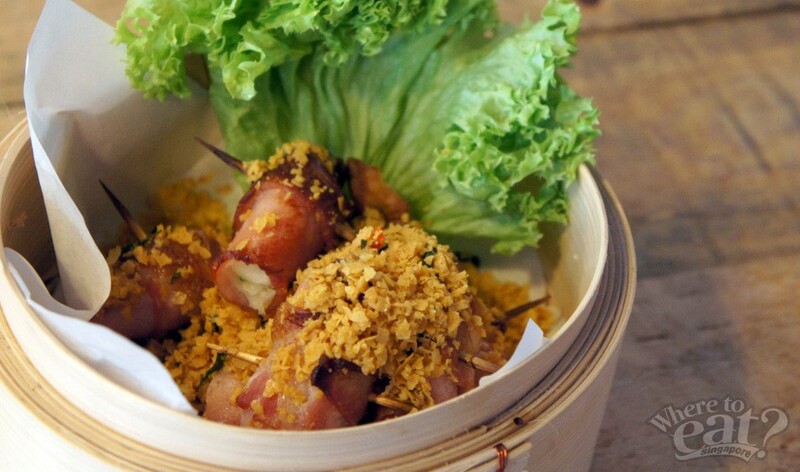 Its texture is similar to that of crispy cereal prawn dishes that Chinese restaurants serve, but a whole lot more Westernised given the genius addition of bacon, and cucumber slices too. 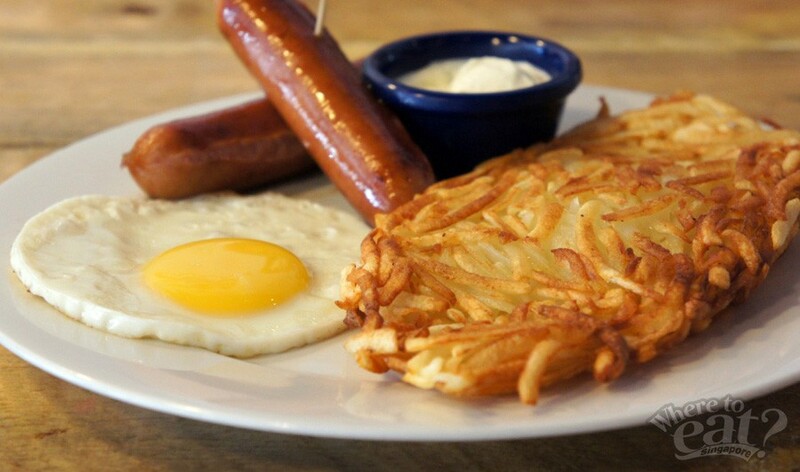 The next time you crave for some good old Rosti ($15.90), be sure to try this one. The rosti is handmade with shredded ‘Russet potatoes and lightly fried to crisp perfection. Paired with juicy smoked Bratwurst and cheesy sauage, we thought this dish would make a great alternative to Bangers and Mash, or any other sausage breakfast. 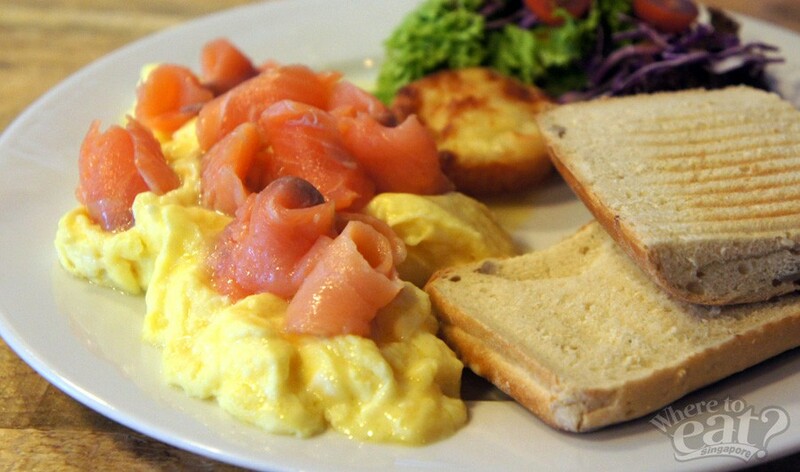 There is no reason not to like the Norwegian Smoked Salmon Scrambled Eggs ($15.90). For one, the portion of smoked salmon and buttery creamy scrambled egg is so much – that if sandwiched between two pieces of lightly toasted focaccia bread, they would just completely come out of the sides. Paired with sweet cheesy baked tomato, we reckon the ensemble to be great for those seeking a slightly heavier brunch. 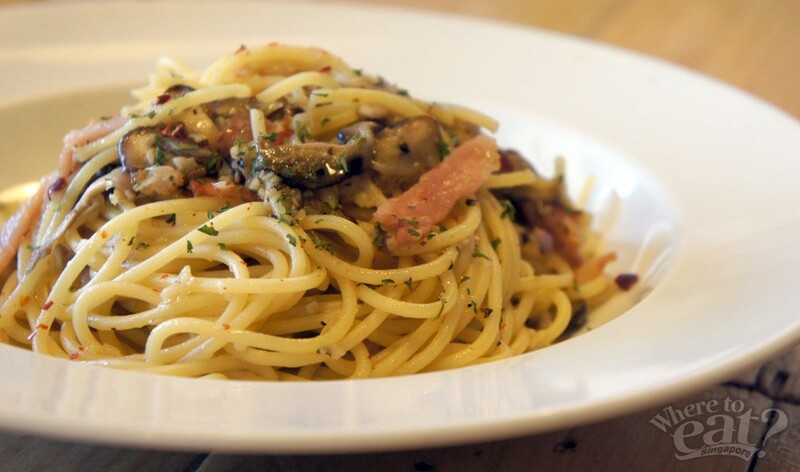 Bacon Mushroom Aglio Olio ($9.50) is always the answer if you are spoilt for choices. The spices and ingredients had mellow tastes that did not overpower each other, we found this dish light and pleasing. Not too spicy, and definitely not too oily. It made the perfect closure to our brunch at Tolido’s Espresso Nook.